The Tamworth originated in Ireland where they were known as “Irish Grazers”, being given that name due to the fact that they were such wonderful foragers. About 1812 Sir Robert Peel, being impressed with the characteristic of these hogs imported some of them to his estate at Tamworth, England. It is from this place they derived their name. 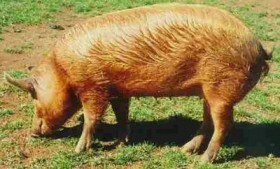 An English authority, who calls it the “Mahogany” or “Grizzly” pig, says it was extensively bred in several of the midland counties of England early in the nineteenth century. When the droves were mainly kept in the woods and forests. They are not a composite breed, and are thought by many to be one of the oldest and purest breeds in Britain. They were long of limb, long in the snout and flat in the rib. They were active, hardy, good rustlers, and very prolific, but they were slow feeders and late in maturing. This has been almost entirely effected through selection, judicious breeding, and management. It is now pretty generally conceded that the blood of other breeds has not been used to any extent in the improvement of Tamworths. Tamworths have been used in developing other breeds in the United States. They appear to have been improved to a considerable extent before the middle of the 19th Century, as they were given First Honors at the Royal Agricultural Society’s Show when competing with large breeds as early as 1847. But subsequent to this period they sank into obscurity, and were only known in some local districts. About 1877 a demand grew up for more hogs of the bacon type, and breeders of Tamworths brought their favorites to the front in England. The first Tamworths in the United States were those imported by Thomas Bennett of Rossville,Illinois in 1882. In the following decade, Tamworths were also imported into Canada and the breed gradually became known in both countries. The Tamworth has two characteristics for which it was entitled to preeminence; i.e. ; an unusual proportion of lean meat, and large litters of pigs; also that Tamworths will make as many pounds of gain, largely lean meat, from a given weight of feed as will hogs of any other breed. From these early imports, the Colorado agricultural College’s three year farm average for all sows was ten live pigs to a litter. 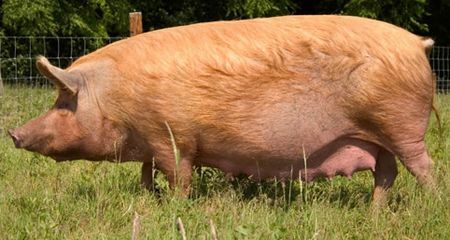 A two-year old sow weighing 750 pounds had 18 live pigs at one farrowing, and a Tamworth at the Iowa Agricultural College raised 33 pigs in one year. 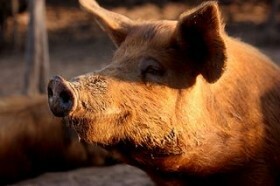 Tamworth Swine are protected by registration in Great Britain, the United States and Canada. The American Tamworth Swine Record Association was organized in 1897.